In this article you are going learn about Automatic transfer to the new employer, Transferring Multipole pf accounts to One pf account which is current, Tracking Pf claim status within UAN Portal or by UAN number without login. Prerequisites, rules, eligibility for Pf transfer and withdrawal, also aware of PF withdrawal forms in different conditions like pension and partial & full withdrawal etc. FORM 13 for transfer to another epf Account. You can’t transfer pf amount to other pf account holder. we cannot transfer partial amount to another pf account. only full transfer available To close old pf account. Both account member details should be same (Name, father name, DOB). EPF Pension amount also transferred along with pf balance. Date of joining & date of exit should be updated by your employer. Your KYC Should be Approved by the employer. you should update bank details at uAn Portal. If you multiple pf accounts then you can do it another way up to 10 accounts. KYC details are seeded against the UAN. Only one transfer request against the previous member ID can be accepted. If previous / present (Exempted) trust bank account and IFS code are available. Please ensure that the personal information is correct before proceeding with claim submission. You can transfer pf amount from one pf account to another pf account. filing a request EPFO OTCP portal. type the URL on your browser epfindia.gov.in and then come to the employee services. click on OTCP online claims portal. then You can create username and password if not created early. 2nd old Pf account details. Part C details present account. Visit epfindia.gov.in >> employee services>> Online Transfer Claims Portal (OTCP)>> Login / register. You can sign in by Selecting a Document from the list, enter the document Number along with the Mobile number and click on sign in. Select the state and pf Office and then enter the establishment code followed by pf Number. Then click on get details you can get previous company details Like company Name & address pf code of the employer. Enter the pf Number and DOB, date of Joining and leaving. Select the claim through p[ressent Assemntrment click On confirm, click to get Pin enter the OTP received on your mobile number. You can Note down the Claim ID and Also download printable Form 13. Improvements earlier 2012: we have to visit the epfo office for withdrawal. 2012-2014: epfo portal launched to download epf passbook monthly once by epfo registration. 2014-2018: UAN Portal launched and its combined employers and employees services etc. 2017-18: Introduced aadhaar number with UAN then the employee can withdraw pf balance without employer signature. PF Automatic transfer by UAN: if you joined the new company then you have to do one thing. just give your UAN Number (maybe aadhar, pan, bank details along with your basic details like name, father name, dob. mobile required) but those are already seeded to your UAN Account. to New employer. Once you logged into the UAN Portal, You may see claim made by you and its status on UAN Portal dashboard. Online Servvices>> Track claims status>> (Online claim / transfer claim / Stop auto transfer claim) status. contact details, KYC and Submit to your employer. download it from epfindia.gov.in Form no 13. fill the details and submit it, to the present employer. then employer request to the EPFO, then epfo team send the documents to the previous.if the previous employer approves your pf account gets transferred. PF withdraw form>>presnet emplpoyer>> epfo>>Previous employer>> successful / denied. How to transfer withdraw epf balance without the employer? It can be possible if Your UAn Number activated and you know it, then login to UAN Portal update your Aadhaar card, Pan card, bank details including IFSC code. 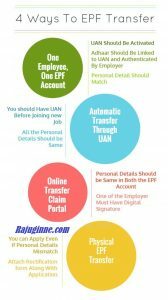 with The Help of Aadhaar and UAN now employees can withdraw transfer epf Account from the previous employer. There are 4 ways to transfer epf balance from other pf to another. Offline transfer if your details didn’t match from old to new pf account. Online Transfer at OTCP Portal same details and employer must have the digital signature. UAN Transfer: if you already have UAN Number while joining with the New employer and the personal details are same then it automatically transferred to the present employer. One Employee one epf account holders all details and UAN, aadhaar must be matched. You can check all epf claims by PF number at epfo claim status portal. Without UAn Number Pf withdrawal is not possible. The minimum time to wait for epf withdrawal is 6 Months & 2 months of unemployment. TDS applicable early withdrawal before 5 years 20% without pan card, 10% by pan number. TDS will not applicable for below withdrawal of 50,000. No tax After 5 years. After retirement in 58 years. EPFO Withdrawal form 31 from Epfo Portal. this form useful to withdraw some portion of the amount from epf fund. EPF Form no 14 for paying life insurance schemes like Pay LIC Premium from EPF balance. Form 10 D for getting the monthly pension after 58 years. Pf pension FORM C withdrawal of pension amount before 58 years. FORM 19 will help to withdraw fund from epf balance, withdrawal benefit added after 10 years of service completion. Note: We have transfer PF Account or withdraw within 36 months or 3 years because No interested will be added to the epf balance account. EPF form 19 is different from based on the service of 10 years. Age Group of below 50 years. 50-58 years. over 58 years. FORM no 20 can be sued to withdraw pf amount in case of epfo member died. it is also different based on service years. and age group. Nowadays Epfo Members transferring to PF to another PF Account online with UAn Portal. withdrawing pf amount bank account is now made online very easy. what is the DIfference between transfer & Withdrawal? PF withdrawal means transferring pf to directly to the bank account. while transfer includes transferring existing pf account attached to the previous company to New company to get the benefit of getting active interest by epfo. Note: If you failed to transfer old epf account to the new employer. then old pf account counted as Inoperative account and no interest earned on it (after 3 years). EPF Withdrawal Process online / offline? UAN helpful update employee KYC details like Aadhaar, Pan bank details. and also UAN useful for check pf balance, download uan passbook etc. For Online Pf withdrawal go to epfindia.gov.in >>employees>> Online claim transfer portal OTCP>> Login / Register there. Enter the bank account details, epfo member details, employer details etc. After filling the PF withdrawal form you can download it for offline use. Your Pf withdrawal request along with the goes to the employer and regional epfo office. Then employer verifies the employee details for approval. after that, epfo process your application. Company HR has to visit the Employer login portal and approve the claim. You can submit the Epfo withdrawal form which filled online toRegional EPFO office & employer. This helps to process your application fast. Generally, epfo withdrawal request process within 3-4 weeks. if any delay from employer and epfo office it could take more time. You can check epf withdrawal status at epfindia.gov.in claim status portal. How to check PF claim status with UAN? an employee may change at least 10 companies some of them more. then he has to do the above process again and again. But most of employees leaver their pf balance with epfo. as of now, there are 2000 crores out 4000 pf money not claimed so that benefit will for the government or some corruptions in the GOI. NOTE: the numbers about pf amount hold epfo changes to by every year. Visit epfo claim status page which is temporary, (https://passbook.epfindia.gov.in/MemClaimStatusUAN/). Enter you UAN Number and fill the captcha click on search. or you get messages like (received, processed, pending at employer epfo etc). if you are facing issues please checkout uan helpdesk. after 2 months of unemployment, an employee can withdraw his pf money. But pf transfer gets the advantage to avoid tax and gain interest over the withdrawal. although pf withdrawal has certain rules when compared to pf transfer. members can check pf claim status for withdrawal with their claim ID or with PF Number. but If employees checking claim status for PF transfer there are issues along with employer.The employer plays the main role in settling the claim. There is an OTCP Portal By EPFO, Online claim transfer portal previous it was www.memberclaims.epfoservices.in now https://unifiedportal-mem.epfindia.gov.in/memberinterface/ for employees. login to the members portal, on the claims section check pending claim status along with history. or directly enter your PF or UAN to know the status without login at epfo. There is An Automatic pf Transfer if you submit the UAN and Aadhaar Number then old pf account with the previous employer all the amounts transferred to the present pf account. I, VYAS VIJAY having Family Pension Account Number 10072142380 and Pension Payment Order No. VDBRD0046712 had authenticated my prsesence on 13-01-2017 at Vadodara EPFO Office and has been issued Life Certificate vide Pramaan ID 5249554839. However, I have not received the payment of Family Pension till date 22-02-2017. Kindly look into the matter and release the payment of the unpaid Pension Amount immediately to the credit of my bank account. 1. In private sector, if I decide to take early voluntary retirement due to any reason, like too much stress, health not permitting, cant travel to work place due to distance , family reasons, etc etc., at the age of >50 but earlier than 58, can I not get my entire PF corpus withdrawn ? If not Why ? 2. If employer hands over the pink slip and one is unable to find suitable job, can he not withdraw full pf including employer contribution? 4. Employer shows his contribution as part of CTC of employee in contract, then how come Govt. can hold this part till the age of 58 when it is not contributing anything extra into this fund ? Is it true first of all as a ruling? Request clarification as we ar not able to find correct answers to take appropriate decision on early voluntary retirement. For a private sector employee, total corpus is the only fund for his post retirement life and if one wants to quit early, it will be very difficult if the person is unable to get his complete corpus. Your epf account will be inactive, if it not receive contribution for continuous 3months. You cannot withdraw employer contribution till the age Cross 58 years. This amount goes to pension fund rather than epf balance. Give a reply to know answers of remaining. i am unable to activate the UAN and also guide how i withdral my pf. will it will be easy to transfer PF under current PF account, once multiple PF account number link / mapped to UAN ? Note: We are not affiliated with EPFO. created this sole purpose of helping people & awareness about pf. All the questions answered in the Articles, ask your questions in the comment.